Here you will be able to browse through and download all of my custom font graphics. Many people have asked if I will ever organize and make available all the fonts I have made for Doom over the past couple years. Well, here you go! 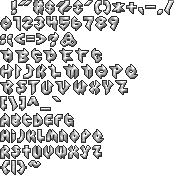 The majority of these fonts were made to be used with the ZDoom engine. However, with some tweaking, they can be used for any Doom port or any game that uses low resolution graphic fonts similar to Doom’s. Feel free to use these in any way you see fit, as long as I am given credit. Check the readme file that comes with the zip for information related to the font and whom to credit. The fonts are separated into two categories: Big and Small. This is because Doom uses a larger font for it’s menu graphics and a smaller font for it’s in-game messages. Entries are organized newest to oldest, top to bottom (as best I can remember). Each font is packaged in a .zip file. Each .zip file contains the font in a .wad file, a .png image file for previewing and editing the font, and a readme. Please note that some of the preview images may differ slightly from the finished font contained within the .wad file. If you plan on using the image as a base for edits, check the patches in the .wad file to ensure they are no discrepancies. Also, many of these fonts have a different sized counterpart that they are used alongside (eg. Bolo big and Bolo small are to be used together). These are my Doom bigfont replacements. They are the font that make up the menu patches in-game (eg. New Game, Load Game, the Level Name patches after you exit a map). However, they are not in image patch format. Rather, I make all of my bigfont replacements using ZDoom’s DBIGFONT lump format. This allows me to easily make the menu patches in batches rather than by hand one by one. You cannot just load up the .wad and have the bigfont automatically replaced. The DBIGFONT lump only works with ZDoom as far as I’m aware, and even then it only replaces certain entries, not all of them. There are a number of ways you can utilize these fonts. You can do what I do and use a script to print out any bigfont patches you need, puke them with a hudmessage, and then grab a screenshot of the images. Or you can extract a .pcx file from the DBIGFONT lump contained within the wad using imagetool. You could also use the preview images, but I advise against that since some of them are out of date compared to the final fonts in the .wad. These are my Doom smallfont replacements. These replaces the fonts that are used for the in-game messages (eg. “You picked up a shotgun!” that appears at the top of the screen). Many ports also make a heavier use of the smallfont for such things as menus and consoles. Unlike the bigfont replacements, the smallfonts are simple patch replacements that replace vanilla Doom’s original smallfont (the STCFN## patches). 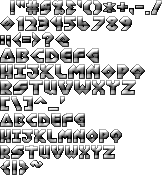 In other words, most of these fonts would theoretically work in any Doom port. However, some ports, like Boom, will not be able to color translate the fonts properly since not all of them are colored with the correct range of red. I originally made most of these fonts to be used in ports like ZDoom where the color translation isn’t an issue. The color translation issue is not a big problem though.